As a highly-caffeinated individual, my ear is always perked for word of the best coffee shops in town, so when Yelp’s email arrived in my inbox with the subject line, “Look directly into this email for coffee ☕,” how could I not open it? 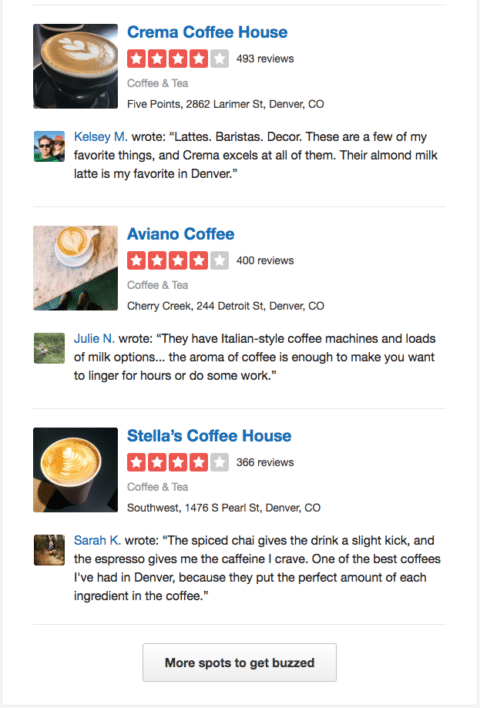 Yelp is a great example of a brand that really gets email marketing, so for those marketers out there that want a refresher on email marketing best practices, or just a little email inspiration, drink in these email marketing insights (and maybe a coffee or 2) along the way. 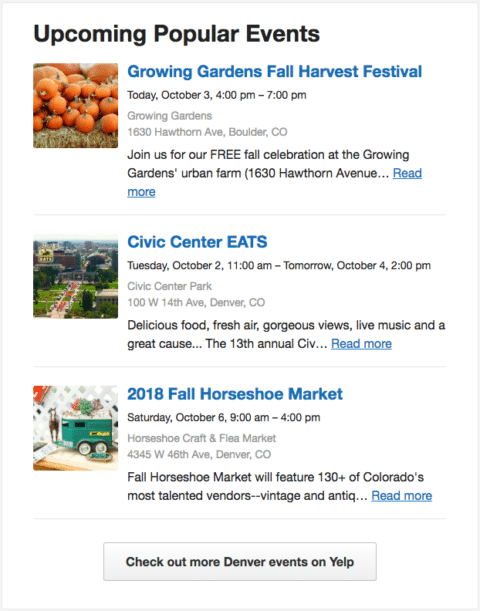 While it’s great to get creative and test different subject lines, it’s also important to stay on topic. 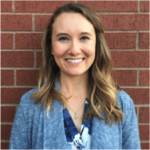 Building trust with recipients revolves around delivering what you promise, and that means staying consistent in your information. As far as emojis in subject lines, it’s still a hotly debated subject, but I think it works in this case since it fits the brand and the email’s message. The rule of thumb is to stay true to your brand and if you do use emojis, A/B test to see if it’s resonating with your recipients. From the subject line to the call-to-action buttons, this email highlights Yelp’s distinct brand voice. Have you determined a brand voice? If not, take a breath (or a sip of your cortado) before you start writing and ask yourself a few questions. How do you want your recipients to feel when reading your emails? What are a few words that you think describe your brand? It’s important to figure out your brand’s voice early on in your marketing. The voice will guide you through the whole writing process, making it easier to stay consistent while keeping your recipients in mind. I often search for cafes and brunch spots in the Denver area, so right off the bat, this content feels specific to me. It even goes a step further and provides information on events happening in my area in the next couple of weeks. Thanks, Yelp—so useful! The individualized content is possible through email list segmentation, which allows you to personalize emails by grouping them by, for example, location, demographic, or previous purchases. In this case, Yelp is segmenting by location, providing valuable content for my area. Consider segmenting your email list based on the information you have about your recipients. The more personalized the content, the more likely people will engage. 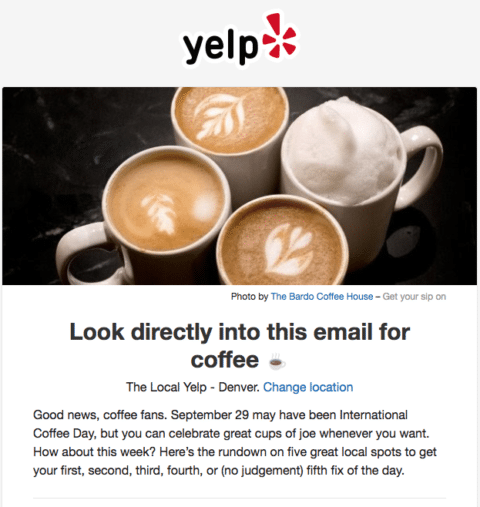 Yelp has links throughout the email directing you to the coffee shops, but your eye is led to the two call-to-action (CTA) buttons in the email. They’re a simple design with creative copy to encourage you to engage with the content. You can A/B test the CTAs to see what works best for your brand. Try playing around with bold vs. subtle colors, plain text vs. buttons, and creative copy to see what recipients engage with the most. From the color to the layout, this email feels like an extension of Yelp’s website. The focus is on the coffee shops and events, and your eye is naturally drawn to the call-to-action buttons. While your emails don’t need to exactly match your brand’s website, try to keep a consistent color scheme and design. This will help your brand become recognizable outside of your website, app, or store. Yelp has the option to either unsubscribe from all emails or to adjust the number of emails you receive by updating your settings on a preference center page. This is an awesome feature for those who enjoy emails from the brand, but feel like their inbox is being overwhelmed. Consider adding this option to your email to keep recipients from unsubscribing completely. Ultimately, your emails should reflect your recipients—what interests them and provides them value. This will guide the subject lines, copy, and overall content of your emails. And while you’re putting together that content, keep your brand in mind. Your recipients signed up for your email because they believe in your brand and the information it provides. Reflect your brand in the big and little details, from overall design to the copy on the CTA button. With these tips in mind, you’ll be well on your way to a pretty fabulous email. For more great email marketing examples, check out our guide: Examples of the Best Email Marketing Campaigns of 2018.